New mums and dads have enough to think about, so we’ve made our new electronic steriliser as easy as 1,2,3. To help you get going, our electronic steriliser comes with a starter kit including one Tommee Tippee BPA free Closer to Nature easi-vent bottle, a bottle brush and a pair of teat tongs and a Closer to Nature Pure Soother 0-3m. 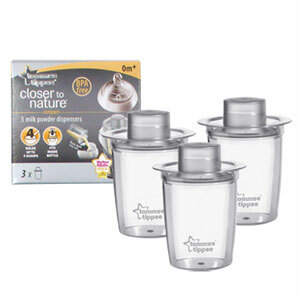 It holds up to 6 standard neck or 5 Closer to Nature bottles with accessories. A 5 minute cycle time to sterilise your baby’s feeding equipment extra quickly yet just as effectively. The clear digital display shows you exactly which stage the process is at and, if you leave the unit closed, counts down from 3 hours to let you know how long the bottles will remain sterile. The clever space-saving shape and flat back means it can be tucked out of the way on the kitchen worktop. The hinged lid has been specially designed so condensation runs back inside the unit when opened and, for extra safety, it’s lockable to keep out prying fingers. On top of all of this, it features a detachable sterile work surface to ensure your bottles remain sterile while you prepare baby’s feed. It’s also easy to take apart for cleaning and descaling.